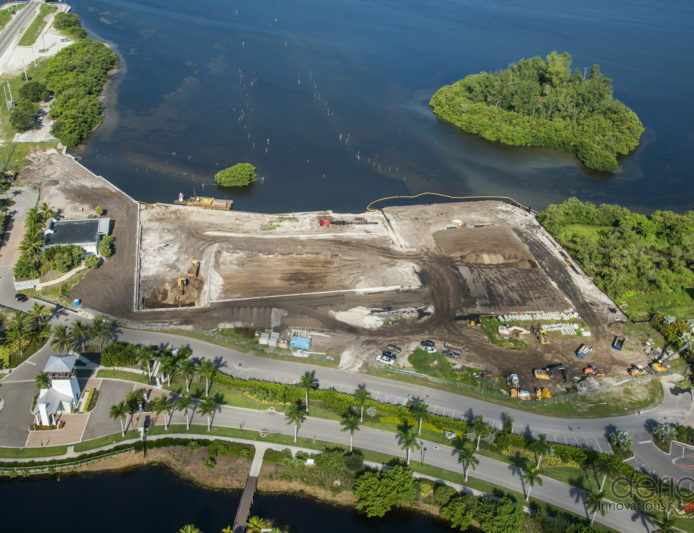 Minto Communities and Margaritaville Holdings today announced that construction is progressing on the new deep water marina at One Particular Harbour Margaritaville, located at Harbour Isle, a 220-acre private island community on Anna Maria Sound in Bradenton, Florida. The One Particular Harbour Margaritaville marina and adjoining neighborhood of 132 luxury residences are being developed by Minto in partnership with Margaritaville Holdings. Move-in ready homes are available now, while construction on the marina is slated for completion in spring 2018. 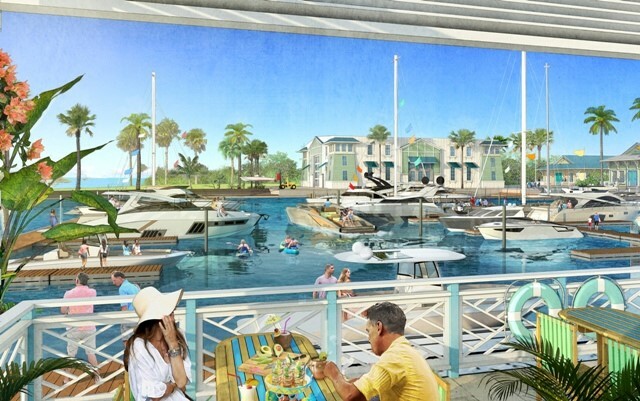 Featuring direct, no-bridge access to the Gulf of Mexico, the marina at One Particular Harbour Margaritaville — aptly named after Jimmy Buffett’s hit song of the same name — will include 55 wet slips and 128 dry slips, ships store, and up to 30,000 square feet of commercial space with a signature Margaritaville restaurant concept, entertainment and shops. State-of-the-art aspects will include floating boat docks and an enclosed boat storage facility capable of supporting vessels up to 42 feet in length. Featuring Margaritaville-inspired design and finishes, all One Particular Harbour residences offer spectacular views of Anna Maria Sound or the Harbour Isle lagoon. Priced from the high $400s, residences range from 1,483 to 1,650 square feet under air. Floor plans include two and three bedroom homes with two or three bathrooms, a spacious master suite, gourmet kitchen, dramatic living and dining areas, and an expansive screened lanai. Two new furnished model homes are open for viewing and move-in ready homes are now available for quick closing. In addition, for a limited time, Minto is offering priority boat slip reservations with each new home purchase. “One Particular Harbour Margaritaville waterfront residences provide owners with walkable access to boating, dining and entertainment on Florida’s last private island in one of the most iconic Gulf Coast settings. There is no other place like it,” says Bullock. “Owners also have the option of placing their home with a rental agency for short term rentals, making their vacation home work for them year-round,” he adds. One Particular Harbour Margaritaville is the third and newest neighborhood at Harbour Isle. The first two neighborhoods — Mangrove Walk and phase one of Edgewater Walk — sold out soon after opening. Each neighborhood has its own private amenities, including a resort-style pool, kayak launch, outdoor kitchen and more. All owners have access to the 23,000 square-foot Beach Club at Harbour Isle, which opens to breathtaking views of Anna Maria Sound and the Intracoastal Waterway. Impressive luxury amenities include a 4,200-square-foot fitness center, second floor Sky Bar Lounge with billiards area and second floor balcony for outdoor dining. Other Beach Club amenities include a covered Cabana Bar, resort-style swimming pool, Jacuzzi, private lounging cabanas, yoga lawn, event lawn and beach recreation for launching kayaks and paddleboards. Winner of multiple Parade of Homes awards, including “Best Overall Community” and “Best Amenities” for six consecutive years, Harbour Isle’s charming southern coastal style architecture presents an inviting picture of relaxed waterfront living. A gated entrance, distinguished by a lighthouse-style observation tower, opens to a Royal Palm-lined streetscape bordering a 38-acre lake at the center of the community. A two-mile walking path meanders throughout the island with scenic bridges and hammocks for relaxing. 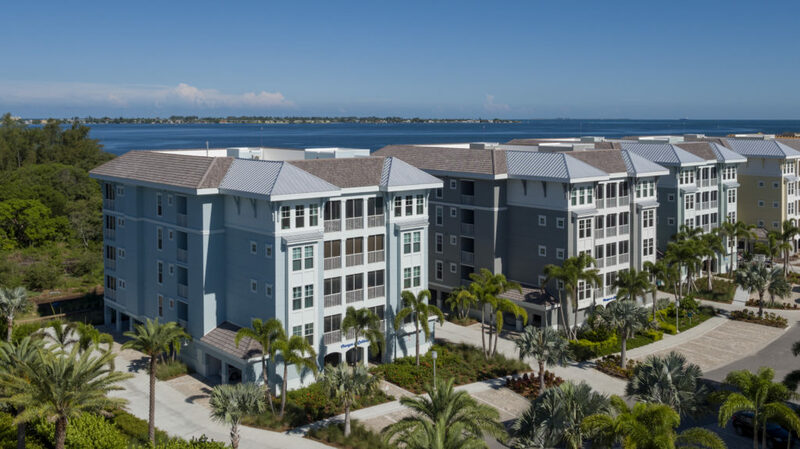 Harbour Isle is located at 12300 Manatee Avenue West in Bradenton, Florida. The Harbour Isle sales center is open Monday through Saturday from 9 a.m.-5 p.m. and Sunday from 11 a.m.-5 p.m. For information, call 888-827-3061 or click here.